The Illinois eviction notice forms are used to notify a tenant that they may be facing eviction proceedings if they do not comply with the landlord’s request. Landlord can provide notice to require tenant to pay past due rent, to cure a default, or to vacate the premises. If the tenant fails to comply with the notice, Landlord may commence eviction proceedings, called a Forcible Entry and Detainer Action with the Local Circuit Court by filing a Complaint. Afterwards you will receive a copy of the Complaint and a Summons which will then be served on the tenant and begin the process where the tenant may be able to file an Answer to counter the claims made by the landlord. A hearing will be set and the Judge will decide in either the landlord’s (plaintiff) or tenant’s (defendant) favor. 5-Day Notice to Quit (Non-Payment of Rent) – In accordance with 735 ILCS 5/9-209, a landlord may provide written notice that the tenant is behind in his or her rental payment and will have to vacate the premises if the rent is not brought up to date. The landlord must give the tenant five full days to pay. 5-Day Notice to Quit (Unlawful Activity) – In accordance with 735 ILCS 5/9-120, a landlord may give 5 days notice vacate to a tenant who is engaged in illegal activity. 10-Day Notice to Quit (Non-Compliance) – In accordance with 735 ILCS 5/9-210, a landlord may provide notice to the tenant to vacate for not complying with the terms of the lease. 30-Day Notice to Quit (Month to Month Tenancy) – In accordance with 735 ILCS 5/9-207, a landlord may provide notice to a tenant that he or she does not intend to renew a month – to – month tenancy and that the tenant must vacate by the end of the 30 days. In Illinois, rent is due on the date agreed to by the tenant and the landlord in the lease. If a tenant is late paying rent, landlord must give written notice to the tenant and the tenant has five days to respond. Step 2 – If the tenant fails to respond to the notice by remaining at the premises and continuing to be in breach of the lease, landlord may commence proceedings in the Local Circuit Court. The first step is to file a summons and complaint with the clerk of the court. You will need to have three copies: one for the court, one for yourself and one for the sheriff. The court will have the Summons and Complaint form for you to fill out. Here are samples of the Cook County forms: Complaint. You will also need a filing fee of $234. Step 3 – After you have filed the documents with the clerk, you will have to get a copy and deliver them to the sheriff’s department to have them served on the tenant. The Sheriff also charges a fee of $60. The tenant will then be able to counter the landlord’s claims by filing the Answer Form with the Circuit Court. Step 4 – The next step is that the court will schedule a day in court. If the tenant doesn’t show up or the judge finds in your favor, he or she will issue an Order for Possession which will require the tenant to move out by a certain date. If the tenant does not move out, you will have to have the sheriff effect eviction by providing a copy of the Order. The Name of the intended recipient of this document must appear on the first blank line at the top of this page. Ideally, you will present the exact spelling of the Tenant or Subtenant as it appears in the Lease. The Location of the Premises will need to be documented to solidify the Rental Property as that being Leased to the Tenant by the Landlord. The facts regarding this location should be identical to those in the Lease. The first statement will contain five blank spaces. In this order, report the Rental Property’s City, County, Zip Code, Building Number/Street, and Apartment Number (if applicable). This Lease will be identified by the facts regarding the Tenant(s), Landlord(s), Property, and Signature Date. This Signature Date is the Calendar Date the Signature Parties signed the Lease and should be located near the Signature area. Report the Signature Date utilizing the three blank spaces in the second statement. You will need to enter the Calendar Day (i.e. 1, 3, 15, etc. ), the Month, and the Year contained in the Signature Date on the Lease. Make sure to enter these components in this order. The goal of this document will be to provide the Tenant (or Landlord) information regarding the Lease Status. Several statements, each with a checkbox, have been provided for this end. You must place a check mark in the statement that best applies to the Subject of this Notice. The first checkbox, “Nonpayment,” will apply to Tenants who will be given five days to pay an Overdue Rent Amount. That is, if the amount listed in this statement is not paid, the Tenant will be expected to return possession of the Rental Property to the Landlord. Here, an alternate Agent authorized to receive such a payment should be listed on the first blank line. Then, the Total Amount of Money owed by the Tenant should be listed. Finally, make sure to list the Past Due Amount that must be paid (in Five Days) along with the time period this amount of money applies to is reported. The second checkbox, “Noncompliance,” will apply to Tenants who will be given Ten Days to correct any damages or violations not allowed by the terms of the Lease he/she/they have Signed with the Landlord. Make sure to report the terms breached by the Tenant word for word as it appears in the Lease. Note: The Tenant will be expected to return possession of the Rental Property if the offenses have not been rectified to the satisfaction of the Landlord. The third checkbox, “Illegal Activity,” will apply to Tenants who have broken a Local, City, State or Federal Law on the Rental Property. Marking this checkbox will require the Tenant(s) to return possession of the Rental Property to the Landlord in Five Days from his/her/their receipt of the Notice. You must list the Criminal Activity the intended Recipient participated in on the blank space provided. The fourth checkbox, “Month to Month Tenancy,” will apply to Tenants who must be informed the Landlord wishes to end the Rental Agreement held. This will require that an exact Date of Termination be listed in the blank spaces provided. It should be kept in mind this end date must be at least thirty days after the Recipient has received this paperwork from the Landlord. This must be at least Thirty Days after the Monthly Rent Due Date. The fifth checkbox, “Month to Month Tenancy,” will apply to Landlords who must be informed the Tenant wishes to end the Rental Agreement held. 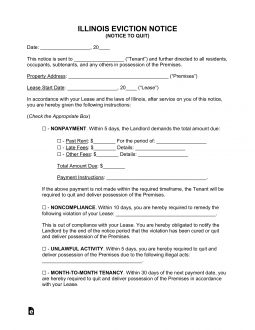 The end date of this Rental Agreement must be reported using the three blank spaces. In addition to any other restrictions that may be legally applied, the Tenant must list the end date as being at least thirty days after the Landlord’s receipt of this paperwork. Landlords or Authorized Representatives must make sure to read the paragraph located near the bottom of the page. If applicable, the blank line below this paragraph must bear the Signature of the Landlord or Issuing Agent who is filing this paperwork with the Tenant. The final section of this document has been provided so that a verification of delivery may be reported to the interested parties. The individual serving this paperwork will need to report the Date this document has been delivered, in the first statement below the subheading “Certificate of Service.” as well as the Name of the individual who received it. Delivery may be reported as having been made first hand to the intended recipient named above, to a second party who may be considered reliable (family member, co-worker), or as a First Class Mailing to the intended recipient with a check mark in the first, second, or third checkboxes (respectively).